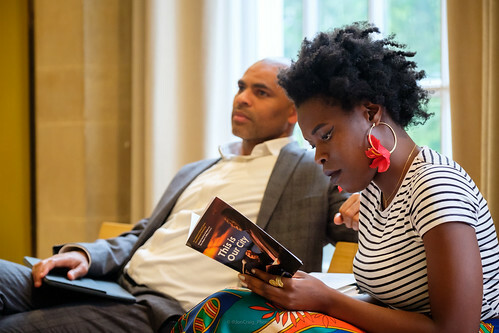 Miles Chambers was appointed Bristol’s first City Poet by the newly elected Mayor of Bristol, Marvin Rees, in May 2016. This blog looks back at his term of office. As City Poet Miles has written and performed poems for Bristol City Council on the theme of car pollution in the city; for Mary Prior to celebrate her tenure as Lord-Lieutenant of the County and City of Bristol; for the swearing-in of the new Lord Mayor, Lesley Alexander; for the 70th anniversary of Bristol’s twinning with Bordeaux and Hannover; for the Mayor’s Annual State of the City Address in 2016 and 2017; and for the Bristol International Balloon Fiesta. He has also received commissions from Avon Constabulary; for a Triodos Bank advertising campaign; and for a BBC Points West film on the seven saints of St Pauls. His poem ‘Bristol Bristol’ was performed at Mayor Rees’ swearing-in in 2016 and at Contemporary Poets and Utopia, a Festival of Ideas poetry evening that formed part of a programme marking the 500th anniversary of the publication of Thomas More’s classic work. He co-wrote a script for an animation made for the Lord Mayor’s Christmas Children’s Appeal and was commissioned to write a poem, social media campaign and radio advertisement for Bristol Energy. He also wrote a poem on the death of Bijan Ebrahimi, the disabled Iranian refugee killed in Brislington in 2013. In 2016 a police constable and a community support officer were jailed for failing in their duty to protect Bijan who had suffered threats and intimidation in the lead-up to the murder. Among the organisations Miles has been involved with are the charity Ablaze, which since 2005 has enabled thousands of young people across the wider Bristol region to be supported by businesses and community volunteers in programmes that aim to raise aspirations and improve skill levels. This collaboration entailed providing guidance on children’s writing skills and grammar; judging a poetry competition; leading a performance workshop; and participating in an award ceremony. He worked with The HOPE – Bristol’s virtual school for children in care – speaking and performing at conferences, running workshops and presenting at the award ceremony for their poetry. He performed and spoke at the annual sleep-over event for the homeless teenagers charity 1625 Independent People and at marches and meetings for the refugee support organisation Bristol Refugee Rights. He acted as a writing mentor with Babbasa, a social enterprise that supports the professional aspirations of young people, and performed a poetry version of the life story of one of the organisation’s clients for a fundraiser night. He also helped residents from Lockleaze and Hartcliffe develop the voice of their community. He regularly featured on ‘Thought for the Day’ on BBC Radio Bristol; took part in an arts and theatre discussion programme on BBC Radio 4; and was in a BFI film exploring Southmead. Quotes from his poems will appear in an exhibition at We The Curious and as part of a display on St Pauls at M Shed. He is currently co-writing an opera on the theme of migration with the Welsh National Opera and was commissioned by the BBC to present a documentary on artistic relics of slavery – Civilisations Stories: The Remains of Slavery. He is grateful for the support he has received from Bristol City Council (in particular the Mayor’s Office), Bristol Energy, Sari, Triodos Bank, University of Bristol, University of the West of England and Voscur, among many others. BCDP has enjoyed working with Miles over the last two years in his role as City Poet and looks forward to working with Vanessa Kisuule, his successor, in the future. An album featuring more of Jon’s photos is available on the Festival of Ideas Flickr photostream.